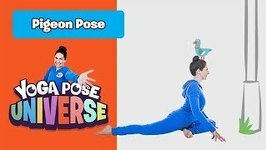 Join Jaime for another fun kids yoga pose! Today's is Pigeon Pose. Pigeon Pose is great for opening our hips and stretching our legs. Try a new yoga pose with Jaime! Today's is Boat Pose. Boat pose is great for your core (that's your back and tummy muscles) - and don't forget to wave to a boat whenever ..
Paschima Uttasana is a seated forward bend that completely tones your torso and legs alike. Shavasana or the corpse pose is the most restorative pose of all. After a long intense yoga workout, it's always nice to fall back into this pose. Upavista Konasana or the wide angle forward bend pose is where every bit of you streched. It strengthens muscles that do not get any movement otherwise. Padmasana or the lotus pose is one of the most popular yoga poses. Your feet are brought as far as your hips. It's a great meditative posture. Tolasana or the swing is very good for your arms...Your entire body swings back and forth with the support of your arms. Shalabasana or the locust post where your torso is flat on the ground and your feet areup in the air. It acts as a counter pose for Bhujangasana. Gomukhasana or cow-face-pose is a workout for your entire torso from, head down to hips. Dandasana, a seated posture with legs outstretched that does a lot for your back! Straightens you up! Anantasana or side-reclining left lifts are tone your muscles completely making them pliable. Vajrasana or the diamond pose is another meditative pose that completely relaxes and empowers you! Bhujanganasa or the cobra pose requires you to raise your torso in the position a striking cobra takes while raising its hood. Baddha Konasana or the bound angle pose does marvels for your knees. They get stronger. Makarasana or the crocodile pose is where the weight of the entire body falls on your tummy! It toughens up your abdomen. Surya Namaskar is a sequence of poses that are put together for a complete and vigorous yoga workout. Dhanurasana or the bow pose is where your body is bent to form an archer's bow. It looks graceful doesn't it? Vrikshasana or tree pose is one of the best postures for balance. The longer you stay the better stability you gain. Supta Virasana is a reclined version of the Virasana. It's just as powerful as the standing version of the posture. Urdhva Prasarita Padasana or upward extended legs pose is a fairly easy pose where you put your feet up. Virasana or hero pose is a powerful pose. It's a soothing posture too and it also acts as a counter to many poses.